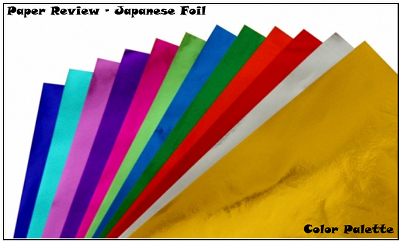 Unlike Tant and Elephant Hide, which are both brand names and each manufactured by one company, there are many varieties of Japanese Foil. 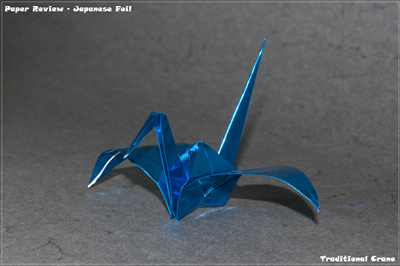 Almost every origami paper manufacturer has Japanese Foil in its product line, just like Kami. Available colors are most likely bright and shiny. 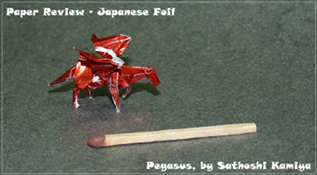 There are two major categories for foil origami paper. There are other options, for example Spanish Foil and even selfmade foil, but this article will focus only on the commercial, thin foil, i.e. Japanese Foil. Although defined by its name, we do not think it is a hard requirement for it to be made in Japan. All we ask for is it to be thin. Very little information can be found on this type of paper. 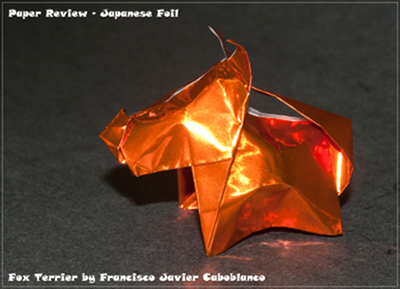 However, there is an interesting article by Dr. Robert Lang called Metallic Paper on the history of foil and of how it became an origami paper. It is basically a thin sheet of paper bonded to an even thinner sheet of metal foil (usually aluminum). The mixture of these two elements creates a hybrid paper, alien in its look and unique in character. Print color on the foil. Pack in rolls and send to Toyo Co. for cutting and packing. Thickness: For some reason, this paper is often sold without mentioning its weight, as if this were not relevant for foil-paper. The only place I found that does provide this data is the BOS Supplies online shop, with 50gsm, 60gsm, and 80gsm papers. With so little official data, once again we decided to weigh the paper. A pack of 24 sheets, 35×35 cm weighs 150 grams, giving a result of approximately 50gsm, as its manufacturer claims. This range - 50 to 65gsm - is considered thin paper. Sizes: From small paper to 50cm squares, this paper has a large range of sizes. In my personal stock I have 3cm×3cm, 7.5cm×7.5cm, 9cm×9cm, 10cm×10cm, 15cm×15cm, 25cm×25cm and 35cm×35cm (the largest pre-cut squares) and even some 50cm×70cm sheets. Colors: The palette is limited, but attractive. The most common options are packs of silver and/or gold, but a 12-color pack is available including green, red, magenta, navy blue and purple etc. As you would expect, the colors are all very shiny and bright. The paper side is almost always white. Paper Coloring or Colorability: This is an excellent paper for coloring. The paper side is easily painted, and the foil part prevents the color from seeping through to the other side. We have no experience with coloring the foil side. Texture: Smooth and bright on the foil side, normal smooth paper on the other side. The paper is completely opaque, so there is little point in folding anything that benefits from back-lighting (e.g. some tessellations). Aging and Wear and Tear: We have a friend who has insects folded from Japanese Foil, and they still look as good as new after 5 years on display! The color does not fade and there are no acid stains or any other signs of aging. Memory: Too much. Once you made a crease with your fingernails, intended or not, the mark will stay forever. But the combination of thinness and high memory can also be an advantage. When you fold the paper in half, it will lie much flatter than with other types of paper. This is helpful especially when you have multiple layers on top of each other. Other paper types will tend to unfold themselves slightly. This can cause the model to disintegrate a bit, or be too fat in that area. With Japanese Foil this doesn't happen, or at least not nearly as much. 10 out of 10. Forgiveness: Reversing a fold is far from easy. The foil part has no forgiveness at all, but the paper part means that it’s still feasible. Score here is 4 out of 10. Tensile strength: Tensile strength is the maximum stress the paper can undergo while being stretched or pulled. This is not a strong paper. The foil part does not prevent tearing, and the paper by itself is too thin. Together they have less than medium strength, far less than printer paper. After 14 creases the foil broke. It took only 36 further creases for the paper to give up completely. A tear across a folding line spread quickly. 5 out of 10. Bending resistance: Bending resistance relates to the amount of force required to bend the paper. The metallic part holds its shape very well. Once puffed, as with my PowerPuff units, it held the figure easily. 8 out of 10. Photogenic: Today a lot of us fold for the camera, since more viewers will be able to see the digital version online than the real one! The foil part makes models from this paper tricky to shoot. Using a flash brings many reflections and this can make it hard to capture the true colors. Every unevenness or crease on the surface of the paper is highly visible (see the Fox Terrier image, later on). All in all - no easy task. Where to buy: Please note: most of the remarks we get about our paper review project are about this section. Please understand, we are not trying to be the "Complete and Unabridged Guide to Origami Paper Shops". We are simply providing some sources based on our experience and hopefully at least one of these sources will be right for you. You can even find some at Amazon. Accurate and sharp creases are easy to make. I think that when using this paper for traditional, flat models the main focus should not be on the folding quality, but on the look of the final model. 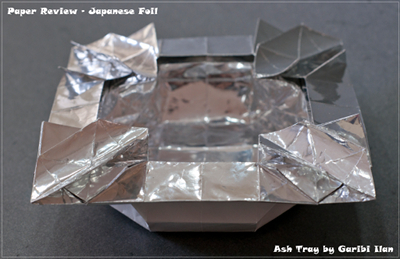 It is fun to fold with foil; you get sharp creases with little effort, and with such a thin paper very accurate results. The final model is easy to shape. 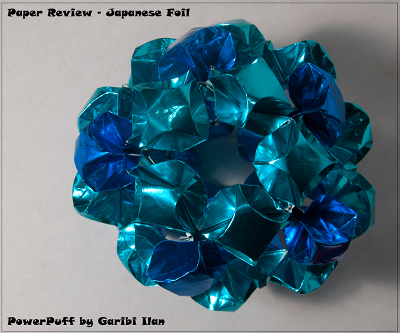 Bottom line - overkill, but folds well and looks good, especially if you like bright and shiny! This paper works well for simple action models, but is too soft for complex ones. The push mechanism works just fine. The pull mechanism of the flapping bird works nicely, but the paper ripped slightly while trying to ease the paper below the wing (before the first flap action). The frog only jumped a distance of 20cm to 40cm, but every jump it made three or four summersaults! Delicate work is essential, given the sensitivity of the surface. This paper is not my first choice for this modular. It was very difficult to make each unit and to puff it. I used Q-tips (cotton buds), gently pushing the paper out from the inside, but got a lot of crumples and paper-breaking-snakes on the surface. Assembling the units was even more difficult. The lack of strength in the paper meant that it was a fight to insert the tabs into the pockets without adding more unnecessary marks. As mentioned earlier, taking a photo of the final spherical result was very problematic due to the excessive reflections. 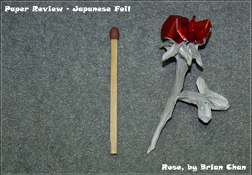 Japanese Foil is too smooth for this model to hold. This modular requires strong paper. Japanese Foil paper won't work for units with deep and tight pockets since it is so thin, i.e. the flaps would not be able to be pushed into the pockets. Also, with so little friction, the model just dismantled when picked up by one unit. Hard to collapse, but easy to mold the final result. For this paper I have chosen the Ash Tray tessellation, yet another variation of the Pineapple tessellation. Folding the grid was a slow process, since I kept my rule that all folds should be bi-directional. Reversing a fold can be done more easily than one would have thought, but it is tedious work that requires careful handling. It took me twice the usual time to make a 16×16 grid. Pre-folding is yet another annoying job, since every random move of a hand makes unwanted ripples and curves on the surface of the paper. Collapsing was easy until it came to the sharp points and corners. Trying to achieve clean and accurate crease lines proved to be impossible. There is no Snap-Into-Place feeling with this paper. The only good point is the ability to sculpture the final details, for example the curves of the cigarette holders. This is the only tessellation we folded, since Mystery is designed to show transparency, and Japanese Foil is not transparent at all. This paper is made for complex models. The only disadvantages are the reverse fold and color loss (cracking) on the creases. This paper is great for this model. Excellent paper for complex models! 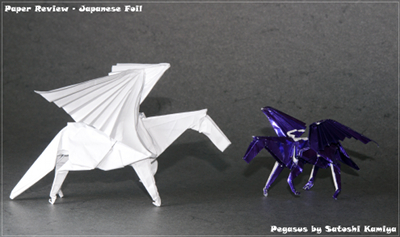 Since Gadi chose the bright side of paper, I once again folded a white pegasus using the paper side as the color side. It wasn't as easy to fold as with Tant, since thickness is not the only factor. Every reverse fold slowed me down, and an open-sink at step 37 was a nightmare. With such a thin paper it was easy to get a nice result, not too fat as with Elephant Hide, and no need to wet fold or glue to keep it in good position, as with Tant. The malleability allows adjusting all details at will; it is easy to shape the the wings and the legs, making sure the model stands equally on three legs. It is very easy to sculpture and get great 3D effects. 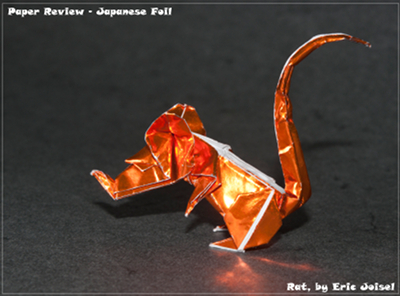 The thinness of the paper with the stability of the foil is excellent for the Rat. Easy to fold and shape. No Wet Folding is needed or possible. Wet folding in this case is totally unnecessary (and not entirely possible!). The foil provides the wet fold benefits. The result is nicely shaped. A perfect paper for miniatures! Gadi couldn't miss the opportunity to add a paragraph on miniatures. This paper is one of the best I have ever used for tiny folds. Japanese Foil is highly suitable for insects. One of the best uses for Japanese Foil. 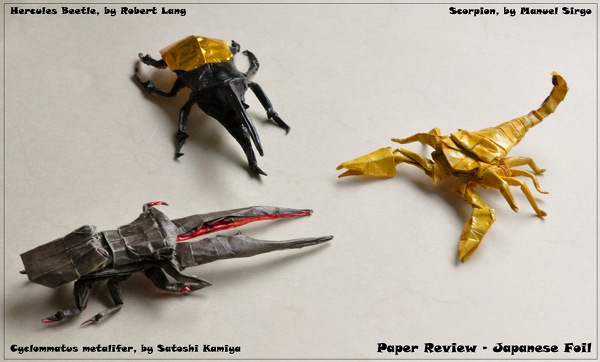 The combination of the paper's ability to hold a shape and its thinness make it perfectly suitable for sculpting legs, horns and antennas into more life-like shapes. Finalizing the model is easy, and takes considerably less time than any wet fold or MC treatment procedure. Moreover, the small size of the final model usually requires a small paper to begin with, making the 35 cm squares more than enough for every insect you want to fold. For some insects, there is also the benefit of the bright side as part of the skeleton. What is it good for? For traditional use it is great if you like the brilliant effect, otherwise it is overkill. Same applies for action models. For tessellations it is not recommended: there is no transparency and therefore no effect when back-lighting; folding the grid is easier said than done, and collapsing is even harder. For 3D models it's good, no need to wet fold to achieve the desired 3D shaping. Complex models will get a very good result due to the thinness of the paper, but bear in mind that the white side really needs some coloring if the model is to be displayed and/or photographed. Adding the final shaping to complex models also tends to be quicker. 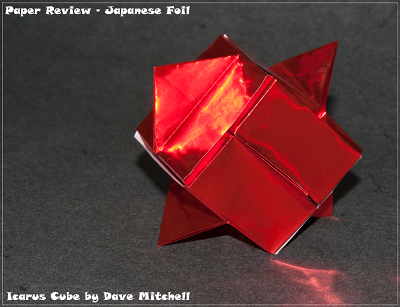 Despite the lovely colors and the variety of small sizes, the lack of friction in the paper makes Japanese Foil a questionable choice for modular origami. This is a unique paper and as such, it is suitable for special projects - mostly complex and high intermediate models, miniatures and 3D models that ask for a lot of molding. Searching through Flickr for Japanese Foil images, I found only 128 images. The large majority of these were 3D models, including complex and high intermediate models. There were no tessellations and only one modular. Half of the models showed the white side, the other half the foil. I then expanded the search to look for foil. This found 2063 images, but most of them were models folded from Tissue Foil, which is not covered here. Bottom line: special paper for special projects. Special thanks to Susser Udi, for his valuable help on coloring and insects folding. While I agree that Japanese foil is not suitable for some modular models, those that have a strong and/or stable lock will sometimes work quite well. In particular, it is my preferred paper for the arabesque unit. I have also found that some Sonobe unit types work well, too. Absolutely, I agree there will always be exceptions. In my opinion Ilan's and Gadi's reviews give suggestions and experiences they made with the paper types. So while in general JP might not be the best choice for modular pieces in general, in some cases it will be a great choice. Your example shown at http://www.flickr.co... is absolutely stunning!